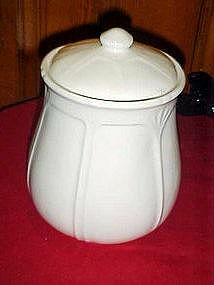 Large white glazed ceramic cannister made by Sears Home line. This may have been part of a cannister set. This one is the cookie jar and measures 9 1/2" tall. Very nice condition with the exception of a chip repair inside the inner lip of the jar. Not noticeable from the outside appearance. At first I thought it to just be a flaw, but it is a chip repair. Marked HOME on the bottom.